The doors of the Arrillaga Alumni Center flew open, revealing halls bedecked with red and white balloons and walls flanked by banners sporting FACE AIDS insignia. The students, dressed in eccentric costumes such as tutus and Stanford capes in a blend of flamboyant colors, trickled into a room thumping with electronic music. While a huge number of students went up to the check-in desk for Dance Marathon, a good number went down the other end of the hall where Code Jam, informally referred to as the “Hackathon,” was being held. 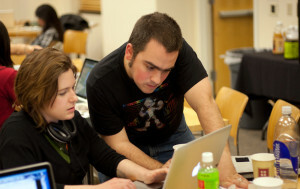 Code Jam is a campus-wide event open to those with coding experience. Coders volunteer to help out with a number of programming projects for various nonprofit organizations. Sam King ’12, Code Jam’s director, noted that a lack of “techie” involvement in Dance Marathon inspired the event in the first place. “There were not a lot of computer scientists participating in Dance Marathon, and that was probably because they wanted a more tangible way of using their skills, so we started within Dance Marathon as the Dance Marathon Code Jam,” King said. “The collaboration worked really well because we bring a more direct service component to Dance Marathon, and Dance Marathon brings a lot of energy to our event,” he added. The purpose of Code the Change’s Code Jam is to allow computer scientists to work with non-profits in a beneficial — and unique — way. Code the Change helps students accomplish this in two ways: by aiding the nonprofits with their social change initiatives and by raising funds for FACE AIDS — an organization dedicated to increasing awareness about HIV/AIDS. This year’s Code Jam coded for a number of organizations founded to improve the lives of others, much like FACE AIDS does for the HIV/AIDS community. For instance, a team of four worked on developing a web-based application for Nilsby, a non-profit that facilitates a support system for families with special-needs children, while another team of three coders volunteered to code for Supporting Initiatives to Redistribute Unused Medicine (SIRUM), an organization that helps reduce the supply chain gap between hospitals with extraneous unused medicines and free clinics that lack such supplies. Palo Alto Mayor Yiaway Yeh and the city’s IT team were present at the event and collaborated with Stanford students to develop a program which lists the streets of Palo Alto, their conditions and the construction work the city has been doing on certain streets, along with an explanation of why this work is needed. Despite the reputation many computer science majors have of being adept at staying up late and pulling all-nighters, the organizers put effort toward ensuring a good, and not too stressful, time for the participants. Angad Singh ’14, project director of Code the Change, noted that participants could take occasional naps during the 24 hours and were kept well-fed with an array of snacks, chips, juice and Gatorade. In order to stay pumped, the hackers took breaks to participate in Dance Marathon, dancing to get their blood flowing and keep their energy up for coding. The coders’ enthusiasm and effort certainly did not go unnoticed outside of the Stanford bubble.